It feels like a lifetime ago, but the Detroit Auto Show came and went this month! There were a lot of trucks and crossovers, some cars, and what you don’t often get to see, the media people doing what they do. Here’s a kind-of behind-the-scenes look at those people. Here are some media people at the reveal of the Lexus LF-1 Limitless Concept, which an organizer for one of the other major U.S. auto shows told me looked like a stark dystopian setting. They weren’t wrong! The Ram stand was a very big deal this year, with the introduction of the new Ram 1500 and Rebel. A guard that roamed around the Ram stand for seemingly the entire day on Monday joined me in watching this host do maybe half a dozen intro takes in the bed of this Ram, trying to get his timing right between the walking and the talking. 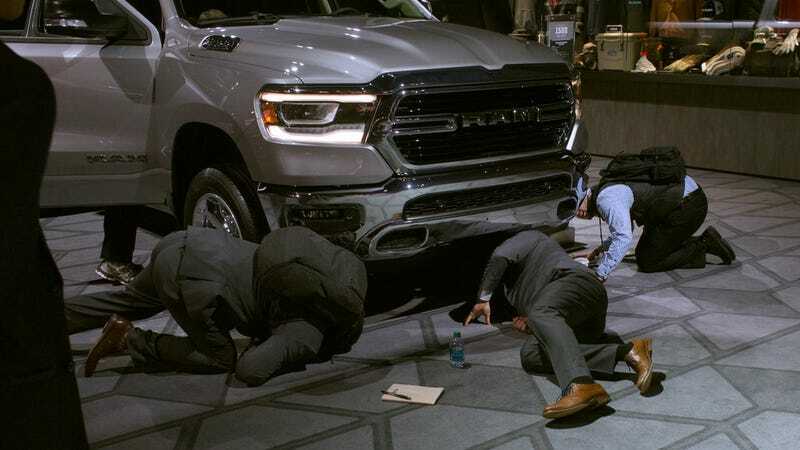 Here, still at the Ram stand on the Monday of the first week of the show, we have three SPIES, or perhaps they were just very serious media men, taking a gander at the guts of the new truck. I also stood guard while our video team recorded David Tracy interview the director of Ram Truck Engineering, Rob Wichman, shepherding other media folk away from the display and our crew. You can watch the interview here. As you can tell from the crowds, GAC—the Chinese company that plans to sell cars in the U.S. by 2019 if the government doesn’t get in the way—had a popular reveal event of a new anonymous car and its new autonomous car concept, which you can kind of see there between the heads. We ended up watching the reveal on the TV screens across the walkway, as there were no chairs adorned with our names. The Infiniti stand was the highlight of the show for me. Infiniti designer Alfonso Albaisa, a fun personality, walked us through the looks and intentions of the new Q Inspiration concept. Later, I interviewed Infiniti design director Karim Habib about the car. This is also a good look at the media scrum that charges the stage right after the reveal. I couldn’t get a good shot of the interior, but I’m sure all of them did. Even the influencers. Here’s Jalopnik boss Patrick George in the 2018 Mercedes S-Class Coupe we rolled around Detroit in. It ruined him. That’s Jalopnik Managing Editor Erin Marquis being interviewed by WDET, a local radio station she used to work for. At the end of the media days on Tuesday afternoon, I ran around like a maniac to see what I could find as things were getting reorganized and “kid-proofed,” as a coworker put it. In the press room, there’s a divider that established a guarded reserved area, where big names like Motor Trend, Car And Driver, and The Verge reside. Then there’s everyone else, in an identical setup on the other side of the wall. Nobody, much, talks to each other though. It’s winter in Detroit and there’s a lot going on, and everyone seems busy and miserable. Or maybe they’re all just trying to find Christian von Koenigsegg.